We are pleased to have many specialty pieces of equipment in our office that help our doctors to better diagnose and manage your eye health. This special digital camera is an easy-to-use instrument that can capture high resolution color and monochrome images of the retina and the anterior segment of the human eye. These pictures can help our doctors diagnose and monitor for changes in both benign and vision threatening diseases. It is equipped with automatic focusing and capture making its use quick and simple. A 16.2 megapixel camera back provides high resolution images with a 45° field of view. The incorporated filters and internal firmware allow the user to obtain color and red-free images. 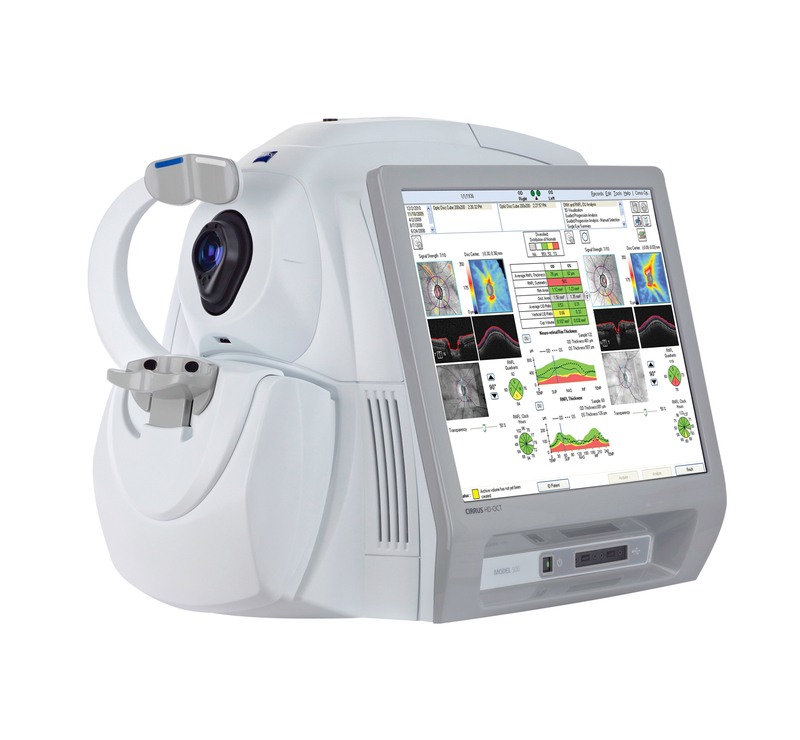 This specialized piece of equipment delivers accurate, high resolution images of the front layer of the eye. A series of 24 rings measure over 10,000 data points on the corneal surface. Our doctors can use this information to better understand subtle changes in the relationship that exists between a contact lens and the cornea. It is an invaluable tool in diagnosing conditions like keratoconus or fine tuning that contact fit in patients who have had a corneal trauma. CIRRUS HD-OCT offers comprehensive care practices essential OCT capabilities with a broad range of clinical applications. It aids in the management of glaucoma and retinal disease, retina assessment for cataract surgery and anterior segment imaging for corneal disease. This wonderful piece of technology is easy to use on our patients and provides same day data that will help our patients understand their situation in greater detail. We also use this information to help co-manage our patients with retinal specialists as the case warrants.